Despite needing to write crib notes on her hand like a third grader cheating on an exam, Sarah Palin excels at using simple images her audience immediately gets. By contrast, President Obama has gone from his straightforward “Yes we can” campaign slogan that rallied the country to presenting complex issues in long sentences. This communication style, which worked well at the University of Chicago Law School, looses the American public. While President Obama is a powerful communicator, he, like many marketers, could take a page from Sarah Palin’s playbook. From a marketing perspective, Sarah Palin does a great job of using images to strengthen her connection with her fans. During the 2008 Presidential campaign, Palin, standing up for family values, focused on her role as a hockey mom, Alaska’s version of the soccer mom. With her five children ready to be paraded on stage as props, Palin played up the “every mom” role. Fast forward to today. Palin has upped her game and taken the protective mom image a step further. Drawing on her Alaskan heritage, she introduced the Mama Grizzly, scoring big-time with the media who repeatedly replayed the video, thereby spreading the brand across the nation’s consciousness. Here are three tactics that Sarah Palin is using to create memorable brand associations and how you can apply them to your marketing message. Uses vivid images. Palin compares a grizzly bear to a pitbull. The dog is known for being fierce and mean while the grizzly is fierce and protective of her young. 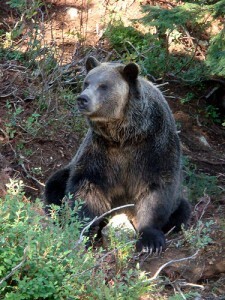 The grizzly’s also a larger-than-life animal that’s native to Alaska and much of the American West. As a marketer, how can you simplify your message to connect with your target market? What images can you use that resonate with your audience? This talks to how your message breaks through the clutter. What can you use that will get your audience’s attention? How can you use the unexpected to attract attention and hold it? Plays on well-known roles. Palin appeals to women, particularly mothers, with the “Mama Grizzly” imagery. This reference’s association with the children’s story of Goldilocks and the Three Bears is a bonus. How is your brand and/or product associated with roles that consumers can identify with positively? A good place to look for these associations are in your company or brand’s history. Keeps it simple. Palin’s image is straightforward, visual and easy-to-remember. This helps spread the word. Think short and sweet. You want your audience to remember and share your message. One Palin trait that President Obama and marketers shouldn’t follow is the disconnect between the image she projects and reality. Despite her do-it-all mom image in the 2008 campaign, Palin was on the campaign trail away from home where her special needs baby needed extra care and pregnant teenage daughter could have benefited from having her mother around. This is a far cry from most mothers’ view of how to take care of their children. As a marketer, make sure that your message and image are in sync with your actions or your market won’t trust you. Palin is recreating her image to avoid the sticky issue of being a quitter, having resigned as Alaska’s governor to focus on earning big bucks with books and speaking engagements. In a wired, socially connected world, Palin’s actions are transparent. She is neither genuine nor sincere. While for some, Sarah Palin will never be more than the woman who gave up political office for personal gain, she does provide useful marketing lessons that are worth learning for your marketing communications. This applies to President Obama, too. Note: The grizzly bear appears on the California State flag. Tags Mama Grizzly. Bookmark the permalink. ← Are books becoming extinct? I saw your webblog via yahoo the other day and absolutely find it irresistible. Carry on the excellent work. And one other thing – consistency is essential you can’t be all over the place like Professor Obama. Sarah is consistent in her views and always on message. Her best line was still – what is the difference between a pit-bull and hockey mom — the lipstick. A neighbor mailed this link the other day and I will be eagerly awaiting your next page. Proceed on the great work.